It’s a dangerous world out there, so it pays to take care of your computers and devices. Part of that is process is to take steps to keep your devices secure and free of malware and viruses. Another is to make sure that your accounts and Internet connection are both secure. If you need a little help in this area, then we have just the thing. NordVPN insures that all of your devices’ Internet connections are completely secure. Dashlane is one of the leading password managers on the market. I have used Dashlane for several years now myself, and I can attest to the fact that it is a great way to get your device and account security up-to-date. Degoo gives you 2 TB of encrypted online backup space for all of your devices. Panda Dome offers protection from viruses, malware, ransomware and other online threats. Combine all of these services and you have a comprehensive online security solution for all of your devices. 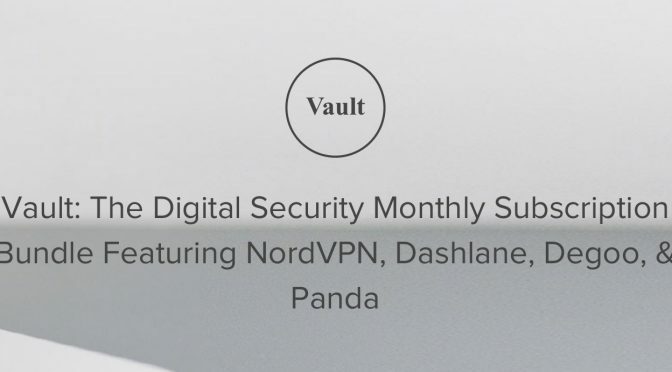 Our Deals site is offering Vault: The Digital Security Monthly Subscription Bundle for $9.99 per month. Previous PostReview: Sandmarc Telephoto Edition LensNext PostIs Apple Working on a Gaming Subscription Service?